Focus on worldwide best practices. March 1 at 11:00 AM EST, 2 hours. Gary Brown, the conference organizer, notes that "Companies suffer an average of 17 malicious attacks and 12 sustained probes on a monthly basis. In fact there was a major attack from the Internet of Things during the week of November 6, 2016." 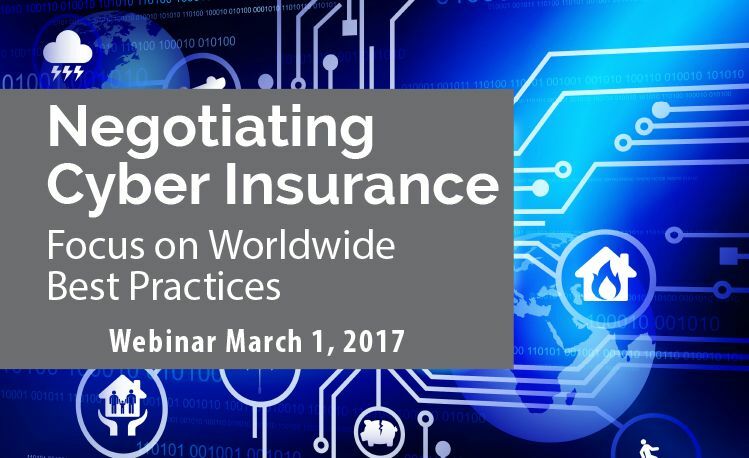 According to Gary Brown, " As data breach incidents and related cyber risks increase and gain publicity, and as government agencies become more actively involved in policing the corporate response, companies need to take a close look at the protections provided by cyber risk insurance policies." The program will focus on the important terms and conditions of cyber policies that can have a significant impact on available coverage. Steve Raptis has two decades of experience handling complex insurance claims on behalf of commercial policyholders. Daniel Garrie- (Law & Forensics LLC) He is the editor in chief of the Journal of Law & Cyber Warfare, a fellow at the Ponemon Information Privacy Institute, and is on the Board of Advisors of several cybersecurity and technology start-ups. Gamelah Palagonia​ (Willis Towers Watson) Gamelah is a Senior Vice President with over 25 years of risk management and insurance experience. Jeffrey Batt (Marsh) Jeffrey is a Vice President in Marsh's Cyber Practice / Cyber Center of Excellence, a national team of specialists. In this capacity, he develops cyber risk management and transfer solutions for large domestic and global corporations. Policy territory-Does the policy cover operations outside of the US? What is the global impact of cyber attacks. · Coverage such as privacy liability coverage. This includes liability to the insured's customers, clients and employees for breaches of their private information..
· Regulatory actions. There is substantial variance among cyber policies regarding what coverage they provide for regulatory and other governmental actions. · Notification costs. There is an ever-increasing landscape of breach notification laws on a state-by-state basis. What control does the insurance company have over the notification process? · Transmission of viruses/malicious code. · What is the appropriate trigger language, and what defense does the insurance company have? · What is the coverage for acts and omissions of third parties?